Join Artfully Rooted Marketplace for a "make and take home" class for children taught by local small business owner Christy Hein. 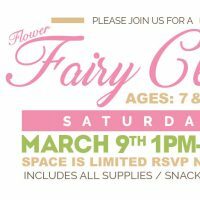 Materials are provided for up to two flower fairies (pipe cleaners, artificial flowers, and embroidery thread and yarn. Note: Each child needs to be accompanied by a supervising adult; adults are free (unless would like to participate!). A minimum of three students must register in order for this class to run, adults are not included in student head count.